No store. No business plan. Why is this couple’s business so successful? The topic of gaff taxidermy may pop up when you chat with Jennifer Garcia and Andrew Carnwath. “It’s by taxidermists who got bored and put weird parts together,” said Garcia, one half of The Odd Couple, Richmond’s leading subterranean business. 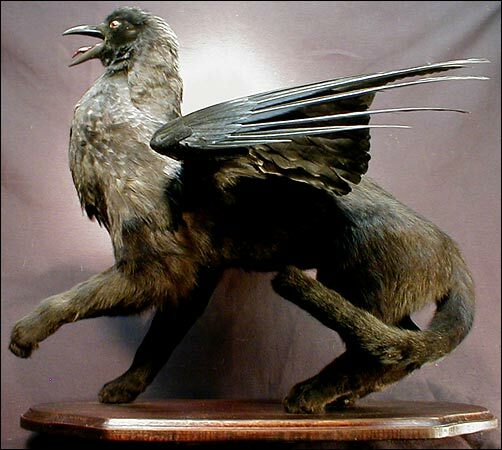 From griffins to jackalopes, gaff taxidermy (also known as rogue taxidermy) are odd items to covet. But Garcia and Carnwath are an odd couple. In fact, they’re The Odd Couple. An object they recently had in their collection was a last rites box. “Basically, it’s a portable church,” Carnwath said. “It’s all the pieces you need to do the last rites on someone.” The couple purchased the box to add to their repertoire of outré odds and ends, but later resold it to a priest. The couple also bought three antique morgue trays once used for cold storage in a Richmond morgue. Two of those trays have been resold, with one going to the DC-based store Mutiny. Once mere collectors, Garcia and Carnwath have turned their predilections for distinct furniture and curio into a fledgling business that succeeds by doing everything it can to not be a traditional business. Garcia and Carnwath are Gen Xers going on 12 years of marriage.1 “We met at VCU,” Carnwath said. She studied psychology. He studied electronic media. “I started working on movies while I was still in college,” Carnwath said. One of his first movies was the horror film Cherry Falls, shot in Petersburg. Right after graduating from VCU, he worked on The Contender. For over 15 years, Carnwath’s full-time job has been to supply films and commercials with props and miscellany. He accumulated such a mishmash of items, that he rented a 3,000-square-foot warehouse in Church Hill to house everything. What they did was open their warehouse to the public one day each month. The idea came from Diana Mathews, owner of Era Vintage, who a year ago rented warehouse space from Carnwath. Opening the space gave the public a peek inside the otherwise private collection of furniture and curio. “Basically we’re opening the doors as a sort of yard sale,” Carnwath said. “‘The Odd Couple’ part was born out of the idea that we aesthetically…like quirky things,” he said. Around the same time The Odd Couple began opening their warehouse, they also started doing local pop-up markets. Their first pop-up was hosted by Black Iris, a music studio that was designed by Carnwath. Black Iris liked Carnwath’s work, and so invited The Odd Couple to take part in their pop-up with Ledbury and Shockoe Denim in August 2013. “That’s when we were introduced to Shockoe Denim, which opened the doors for us to use their space,” Carnwath said. The local denim company eventually hired The Odd Couple to redesign their store. The denim dealer also began carrying Odd Couple items for sale in its store during regular hours. 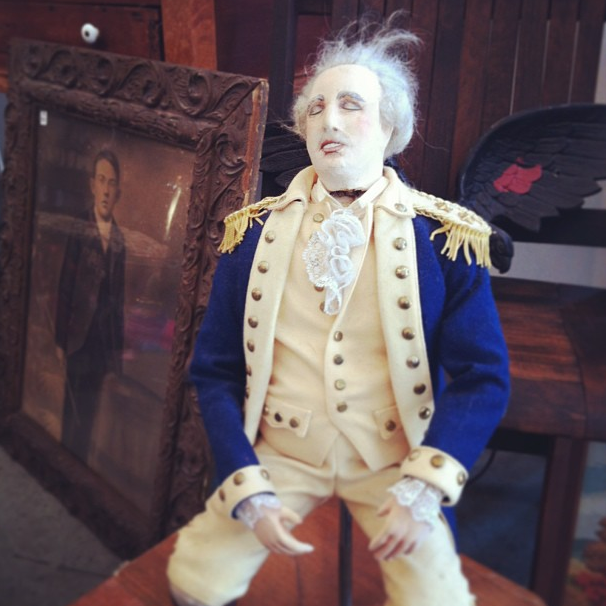 On average, there are between 10-12 pieces of furniture, plus assorted curio, available at any given time. The Black Iris pop-up also introduced The Odd Couple to Ledbury. The clothing company “now invites us to outfit their stores when they do pop-ups,” Carnwath said. The Odd Couple provides chairs, tables, racks, etc. to create a “store feel” at Ledbury pop-ups, which in the past have been located at Stony Point and Georgetown. “They’ll actually build out a store,” Carnwath said about Ledbury’s elaborate pop-ups, which also include Odd Couple items for sale. Garcia said that pop-ups are a great way for the two to sell items. “I feel there’s a very different energy with [pop-ups], as far as customers coming in,” she said. “I feel like because it’s a one-day thing…if [customers] like something, they buy it.” The Odd Couple’s next pop-up will be at the Well-Worn event sometime in May. The Odd Couple’s partnerships with local businesses will grow in coming weeks when Saison Market opens on May 2nd. As with Shockoe Denim, The Odd Couple has helped furnish the space and will in turn sell items in it. The couple said they’ll curate their Saison offerings to cater to the market’s clientele with things like decanters, barware, artwork, and more. Despite a presence in local stores and in pop-ups, The Odd Couple still does meaningful business at their once-a-month warehouse openings. “I think that’s because it’s a warehouse. It’s not a store. It’s an event,” Carnwath mused about the appeal of the monthly openings. “You feel like you’re getting a ticket into something” rather than entering a business open seven days a week. It feels rare, special even. While not immediately interested in opening the warehouse beyond once a month just yet, the two are interested in creating a space for other indie vendors to sell goods. It’d function more as a traditional store, but instead of one company’s stock, the store would carry various items sourced from hobbyists and fledgling businesses. “It’s an antique mall, but a newer version of it,” Carnwath said. A collective store is possible in the future, but the couple has no immediate plans to build a store, whether online or brick-and-mortar. Instead, Carnwath said he and Garcia will keep their clandestine ways for the near future. “I think what we’re doing is really interesting, in that we’re so scared to commit to opening a store, that we’re doing everything you can not to open a store,” Carnwath said. Follow The Odd Couple on Instagram and Facebook for updates.